A years long push for a park at 20th Street is inching closer to fruition. 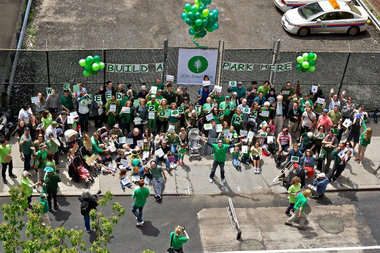 CHELSEA — A years-old dream of turning a Chelsea parking lot into a green space is closer to becoming reality. The city has agreed to pitch in $5.3 million towards turning a 10,000-square-foot Sanitation Department lot and turning it into a public park on 20th Street between Sixth and Seventh avenues, officials announced Sunday. This spring, the Parks Department will ask for community input and demolition of the structure on the site is expected to begin about a year later, according to Parks Department spokesman Sam Biederman. The project is expected to cost $5.8 million in total, $1 million of which was allotted by Councilman Corey Johnson's office, $4.3 from the mayor's office and another $500,000 from private donations. Residents have been campaigning to turn the 10,000-square-foot lot owned by the city's Sanitation Department into a park for more than five years. The area is in desperate need of more parks, residents said, citing a Furman Center study that named Community Board 4 as the worst district in Manhattan for access to green space. Just 75 percent of residential units were located within a quarter mile of a park. The second worst community district was the Upper East Side, Community Board 8, where 83 percent of residents live within a quarter mile of a park. All other Manhattan community districts scored in the 90s, according to the study. Matt Weiss, 37, one of the Chelsea residents who helped spearhead efforts to get a park back in 2010, has three young kids and is familiar with the schlep out to the Hudson River Park. "It's like a full day's adventure and by the time you get there one of them has fallen asleep," he said. "These don't seem like long distances but [they are] to young children and to seniors." The dreams of a park on 20th Street were nearly dashed when the city's Department of Housing and Preservation eyed the property for an affordable housing development in 2011. But last year, HPD backed off on its plan, making way for residents to campaign for funds through participatory budgeting. In April, the park project earned 1,342 votes in participatory budgeting, more than any other proposal in the district, and secured $200,000 in funds. "At the time it was really a dream, " said Weiss. "It seemed so insurmountable [to turn] this vacant trash parking lot into a neighborhood treasure. Year after year, rally after rally, it took on a life of its own."